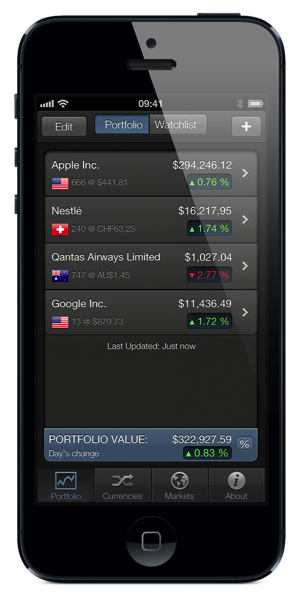 Portfolio is the simple stock portfolio app. If you own foreign shares, or if you just want a simple, uncluttered tool to track the value of your share portfolio, then you need Portfolio! Your Stocks. Your Currency. Your Portfolio. Portfolio tracks the value of your holding in your own currency. No matter where your stocks trade, you'll always know how much you're worth. In addition to your portfolio, create a watchlist of stocks across any of our 30 supported exchanges worldwide. Of course prices in your watchlist are shown in your own currency, too. Portfolio's charts give you a quick overview of the distribution of your wealth, grouped either by currency or indiviual stock holding. And get a quick overview of how all your foreign currencies are trading. Our Currencies view shows the exchange rate for all the currencies in your portfolio or watchlist. For support and feedback, you can send email to portfolio@corduroy.biz, or ask us a question on twitter.